What is the AutoCorrect feature? 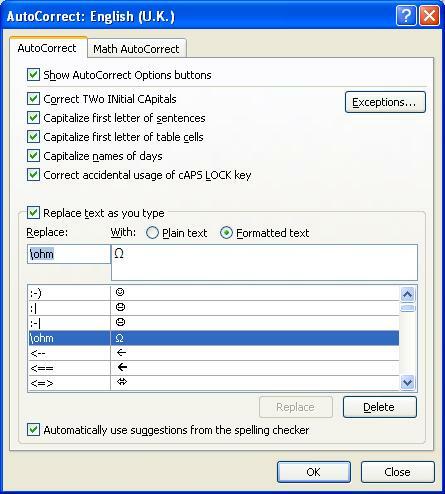 You can use the AutoCorrect feature to insert symbols, other pieces of text, and correct misspelled words. 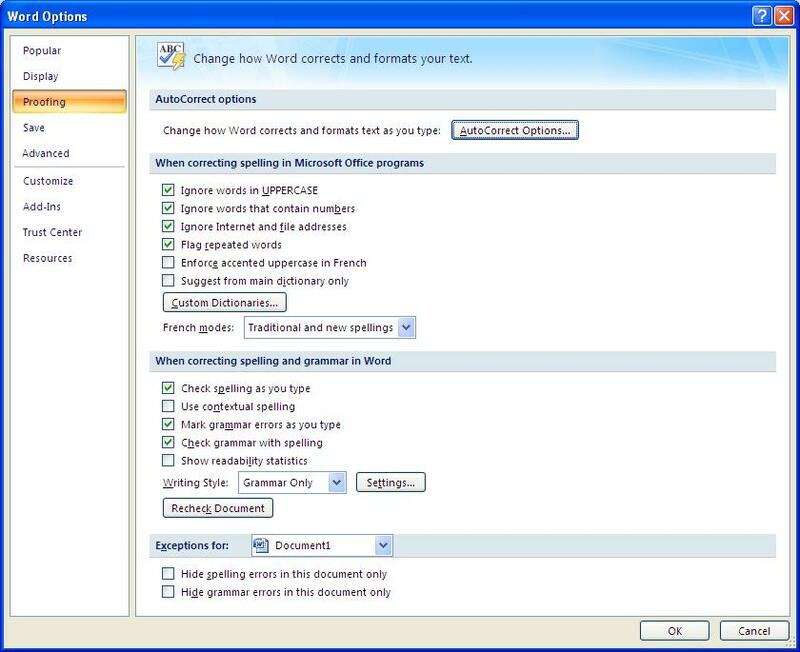 In the post MS Word 2007 – AutoText(AutoCorrect) we had a look how to modify the AutoCorrect list by creating your own entries: Insert symbols and other pieces of text. Click on the Word Options Command Button. Select Proofing in the left pane. Click on the AutoCorrect Options… Command Button. Note: You can also access it by using the steps mentioned in the above mentioned post. If you scroll down a bit in the list you will see that there is actually words. E.g. if you type acn Word should change it to can. This is what I will classify as AutoCorrect. It is a misspelled word that automatically gets corrected as per the list. 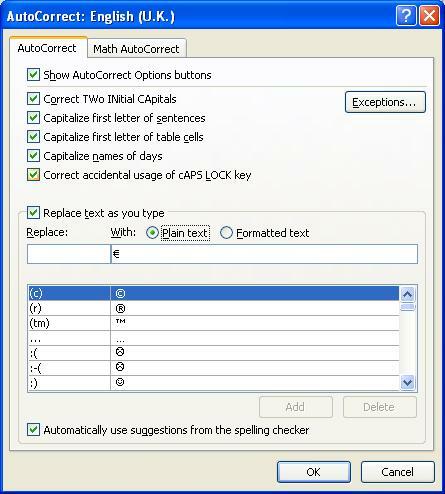 In my oponion AutoText is when you type a certain combination of words it will insert the symbol or the text phrase as specified in the AutoCorrect List. The AutoText feature is called AutoCorrect feature. 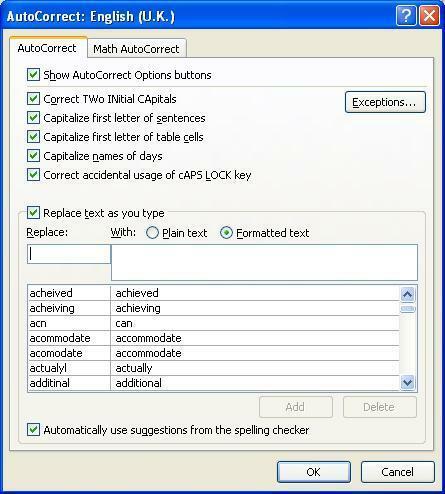 Although we can debate the differences between AutoText and AutoCorrect, that is the way the program works. Hope this clear up the confusion. 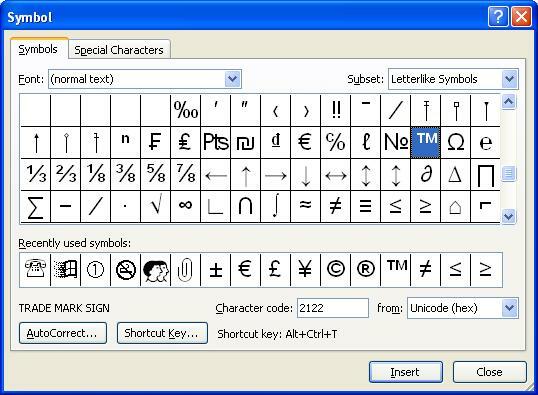 Microsoft Word has the option where you can type a certain text phrase and it will insert any of the following symbols or special characters as per the following figure. Under the AutoCorrect options, click AutoCorrect Options, and then click the AutoCorrect tab. Select the Plain text radio button. In the Replace text box type a text phrase that will be replaced by the text you will specify in the next step. E.g.(ex). In the With text box delete what ever text there is and type the the text you want. Click the Add button or press Enter on the keyboard. Close all the dialog screens. Select the Symbol or Special Character that you want to set up as an AutoCorrect entry. E.g. the Ohm sign. The symbol or special character appears in the With text box. In the Replace text box type a text phrase that will be replaced by the symbol in the With text box. E.g. : \ohm. AutoCorrect text entries can be formatted in the same way as other text with fonts, sizes and colours. You can create as many AutoCorrect entries as you want. Symbols refer to special characters such as copyright © symbol or any other characters e.g. the Ohm Ω sign, etc. On the Insert tab, in the Symbols group, click Symbol. Choose a symbol from the menu or click More Symbols. The Symbols dialog box opens with the Symbol tab as the active tab. Scroll through the list of symbols and select a symbol. Recently used symbols will display in the Recently used symbols section of the window. The shortcut key for the selected symbol will be displayed next to the Shortcut Key button. E.g. For the ™ symbol you can press Alt + Ctrl + T or type 2122 and press alt + x. Note: 2122 is the Unicode(hex) character code of the Trade Mark symbol. Click on the arrow next to the Font drop-down list to see different fonts/symbols. MS Outlook, Webdings, Wingdings are good fonts to use for pictorial or icon like symbols. 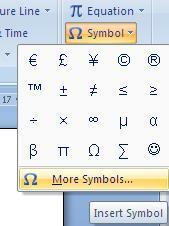 On the Insert tab, in the Symbols group, click Symbol and click More Symbols. The Symbols dialog box opens. Select the Special Characters tab. Symbols or Special Characters can be formatted in the same way as other text with fonts, sizes and colours. 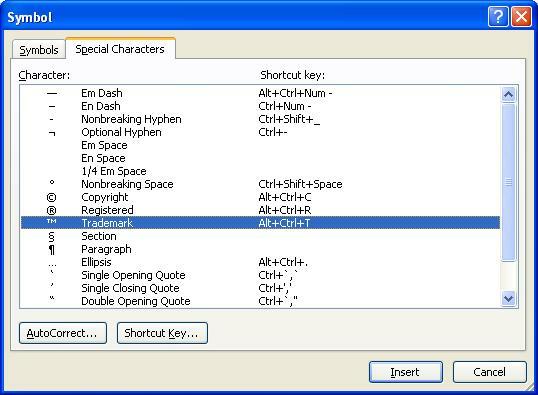 Shortcut Key button: Displays the Customize Keyboard dialog box, where you can assign a keyboard shortcut to be associated with the selected special character. 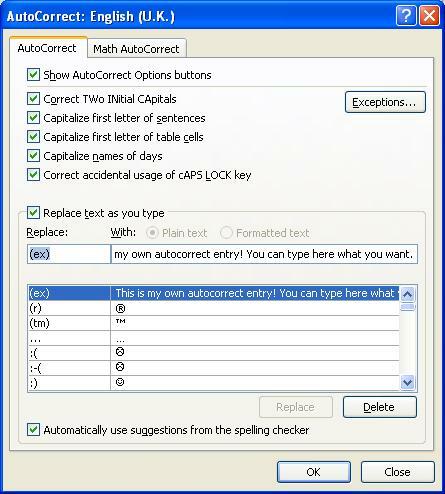 In the next post we will have a look at the AutoCorrect Options. Insert, write and save an equation in Microsoft Office Word 2007. On the Insert tab, in the Symbols group, click the arrow next to Equations, and select one of the saved equations from the list. 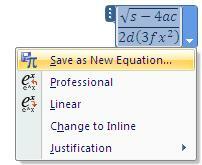 On the Insert tab, in the Symbols group, click the arrow next to Equations, and select Insert New Equations. It will open a blank equation box for you in which you can type or insert a mathematical structure or symbols from the Design tab. Note: You can edit the equation, even if you chose a predefined structure/equation. If the structure contains placeholders, click in the placeholders and type the numbers or symbols that you want. Equation placeholders are small, dotted boxes in an equation. How to save your equation. You can select the equation you want to add. 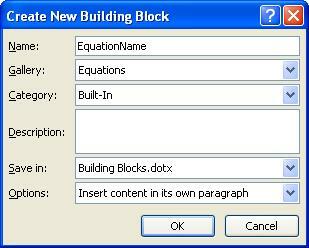 In the Create New Building Block dialog box, type a name for the equation. In the Gallery list, click Equations. If you have the need for this, you can create your own library of equations. Especially useful for Maths and Science formulas. Text is entered at the cursor position. The click and type option enables the user to double click anywhere in a blank area of the document, even after the end of the current document, to move the cursor (insertion point) there. Note: This feature is available only in Print Layout view and Web Layout view. In the Editing section, select Enable click and type option if necessary. It is only effective when you double click in a blank area. Word will insert the necessary lines, tab stops, etc. for you. 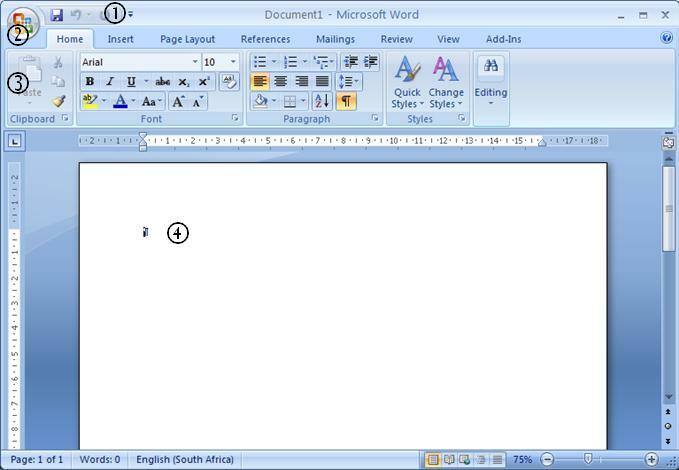 Microsoft Word is one of many word processing software programs. Word Processing refers to the creation of documents such as: Letters, Memos, Agendas, Minutes of meetings, Reports, Faxes, Newsletters, etc. just to name a few. The aim of this series is to have a more in-depth look at Microsoft Word 2007, especially for users that has migrate from a previous version. It has a new look with a whole bunch of new features. The Microsoft Office Assistant has been dropped in Office 2007. The Help has totally a new look. The file extension is docx for 2007 where previous version is doc. You can save any document in a previous version or other format of your choice. This is a toolbar you can customise to add your favourite commands. You can select the items from the toolbar or click More Commands to add any of your favourite commands on the toolbar. 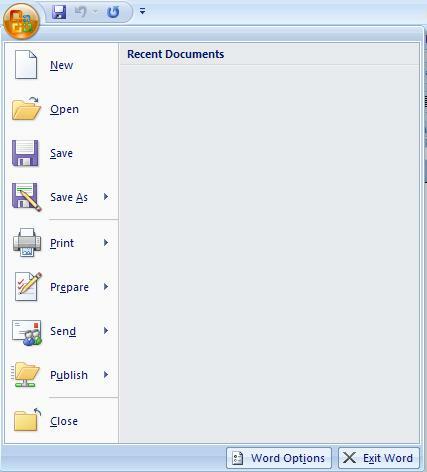 There are no more menus and toolbars, besides the Quick Access Toolbar, in Microsoft Word 2007. These have been replaced by tab paged pages with the icons on it (The Ribbon). Whenever you see an arrow in the bottom right corner, you can click on it to open the related dialog box. At any time you can hide The Ribbon by right clicking on it and select Minimize the Ribbon. To restore just turn Minimize the Ribbon off. The Title & Status Bar. There have been no significantly changes to the Title Bar, but the Status bar can be customised. Right click on the status bar and you can select the options that you want to see or not. To access the templates, click on the Office Button and select New. You will see that you have a few templates installed and that you can download even more templates under the Microsoft Office Online section. 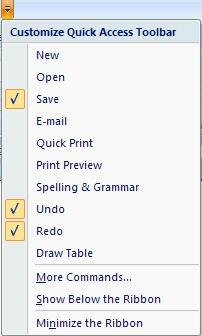 You can customise the preferences by clicking on the Office Button, and select Word Options. Once again it is divided into topics. Username and Initials – Popular Section. Language Settings – Popular Section. Spelling and Grammar Options(e.g. Dictionary selection) – Proofing Section. File Locations – Save Section. Default file format (i.e. docx, doc, etc.) for documents – Save Section. Measurement Units – Advanced Section. Scroll down to the Display Section to change. Use the Insert Key to control overtype mode – Advanced Section .Note: By default this option is turned off. 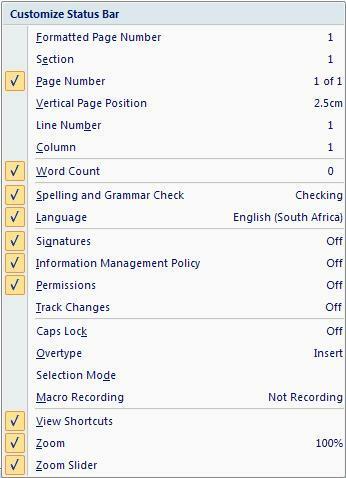 Customising the Quick Access Toolbar – Customize Section. Macro Security Settings – Trust Center Section, Trust Center Settings. The above are just a few and you may or may not have the need to change some or more preferences. You can click on the following icon , just below the ribbon on the right hand side – above the vertical scrollbar, to show or hide the ruler. The vertical ruler you can also turn on/off under the Word Option settings, Advanced – Display section. This is for print preview layout. Where is The “Help About” screen? Select the Office Button, select Word Options, then Resources, and just click the About button. The following will only show when you are busy with a certain object. E.g. Tables, Pictures, Header and Footers, etc. It starts with Alt + 1 for the first item, Alt + 2 for the second item, etc. Definite a new look and feel to get used to.